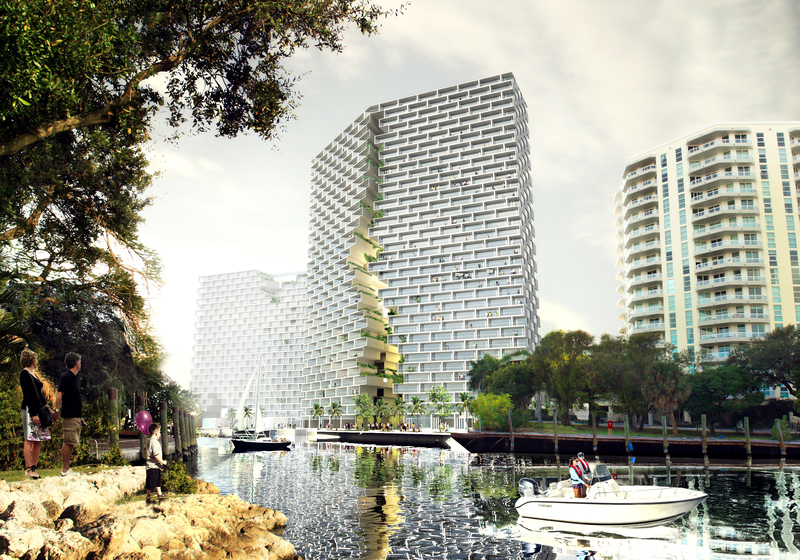 The renderings are striking for Marina Lofts, a $150 million development proposed for a blighted stretch along the south side of the New River in Fort Lauderdale. One of the three Lego-like buildings looks as if a lightning bolt tore through it. Several blocks appear to have fallen off the top of another building. The blocks serve as a bridge, allowing pedestrians to cross an existing water basin. The design for the mix of boutique shops, quaint cafes and 1,000 rentals targeting young professionals is the creation of Bjarke Ingels, a renowned Danish architect. Cymbal insists Marina Lofts will be a dramatic addition to the skyline and draw international attention to Fort Lauderdale – if it’s approved. Cymbal hopes to get the city’s blessing this spring. Construction would begin next year, with the first of three phases opening in 2015. “We’re not interested in building another ordinary box,” says developer Asi Cymbal, 43, a native of Israel and an aficionado of art and architecture. He put together a list of about 10 architects worldwide and eventually hired Ingels, who won the Wall Street Journal’s Innovator of the Year award for architecture in 2011. Ingels, 38, “has a reputation for creating eco-friendly spaces with playful design touches,” the paper said. One of his projects is a large Copenhagen apartment community in the shape of a figure 8. He’s also planning a Phoenix observation tower shaped like a honey dipper. But some nearby residents aren’t impressed, saying the size and unusual design would be out of place in downtown Fort Lauderdale. He and other neighbors also oppose Marina Lofts because it would displace a treasured rain tree. Cymbal said he can safely move the massive tree a block away to a park he’s creating at the entrance to Marina Lofts. Local arborists have said a move could damage or kill the tree, but Cymbal said he’s willing to post a $1 million bond in the event something were to happen. Fort Lauderdale Mayor Jack Seiler said the development has the potential to be iconic – but he doesn’t want it overshadowing the New River and the riverfront. Seiler said he suggested to Cymbal that he scale back the project. Cymbal said he has listened to the concerns of city officials and residents and intends to reduce the size of two buildings from 36 stories to 28. He also plans to move the tallest building, a 33-story structure, further away from the Esplanade condominium, at the request of its homeowner’s association. A marina and water taxi service currently operate from the property. Also on site is the Pirate Republic Seafood Grill & Bar, which replaced the Shirttail Charlie’s restaurant that closed in 2007. Cymbal assumed the leases of the existing businesses and plans to incorporate them into Marina Lofts. He paid $11.5 million for the property as part of a 2011 bankruptcy sale. The apartments would range in rent from $1,100 to $2,000 a month, a niche that Cymbal calls “affordable luxury.” He said a person making $35,000 a year could afford to live at the project. The Related Group of Miami, headed by Jorge Perez, recently broke ground on New River Yacht Club, a 249-unit apartment complex just east of Marina Lofts. The two rental developments are expected to help revitalize the south side of the river.